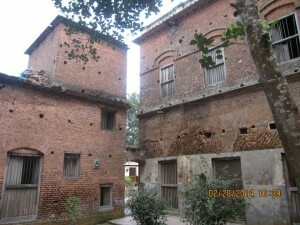 There are a couple of way to move there at the old palatial house from Dhaka. But, the easiest way for a traveler is to take a bus from Gabtoli Bus stop to Saturia Bus stop via Dhaka-Aricha highway. From Saturia Bus stop you may ride on a shared mini bus or CNG auto rickshaw to reach there at Kalighat Bazar via Saturia-Daragram bazar. From there Balia zamindar house is just steps way. There are so many vehicles approaching to Dhamrai from Dhaka. Among those Public transport, Buses are always available running from Gulistan to Dhamrai. But, whenever you are approaching to Dhamrai, You will have to be careful while riding on a Bus. Because, there are two different ways to go there. You will have to catch one moving toward Islampur or Dolivita Bus stop. There is a cluster of Zamindar houses is just few kilometers away from balia, which is known as Baliati Zamindar Palace. 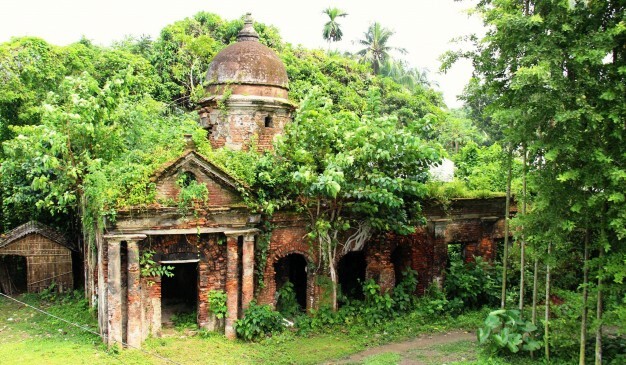 You would rather build an itinerary what could possibly help you to cover all the Heritage sites near Dhamrai and Manikganj area. There are a number of Hotels & Restaurants available in Balia Bazar. Basically, you will find the local cuisine there at the Bazar. Local sweets & Yogurt will make you feel to be back there once again. 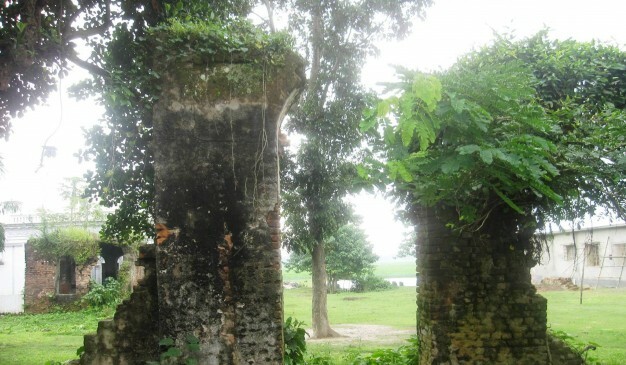 Pal Bari (পাল বাড়ি) is one of the renowned historical places in Munshiganj. 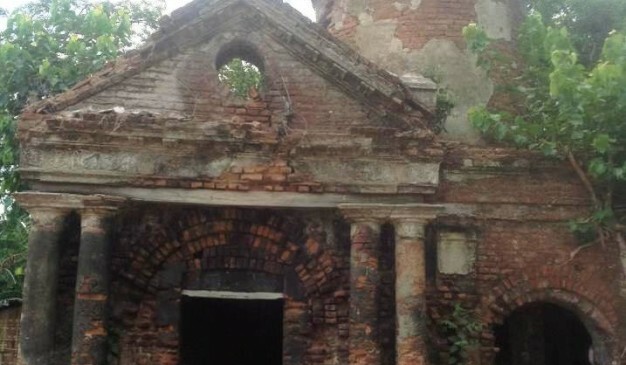 According to the current inhabitants of the Pal House at Abdullahpur, Kamini Pal and Dwarkanath Pal, the eldest two sons of Tokani Prasad Pal, possibly one of the richest business persons of Bikrampur, established this house around the end of the 19th century. They added a few more blocks to the house over the years, but lived within the compounds of their father's house, several miles away. During the liberation war, many of their family members were brutally tortured and killed, prompting the entire clan to leave for Kolkata,India. A few years later Dwarkanath returned, to wind up his businesses here. 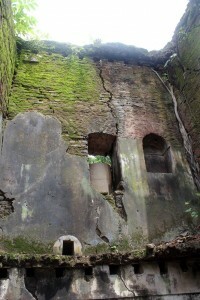 Dwarkanath Pal, therefore chose to spend his last few years at this house. 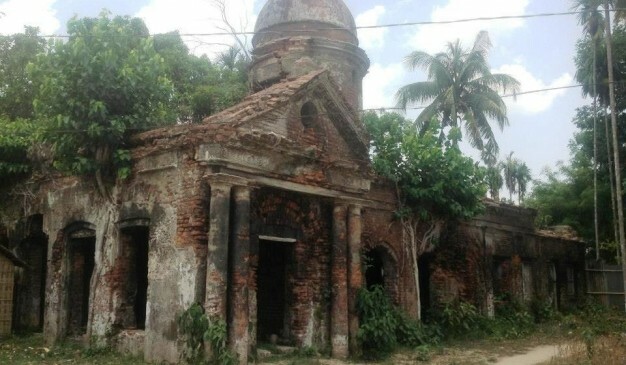 He decided to stay back in Munshiganj, but could not live in his own house. Many others had occupied most of that property. Tengor Shahi Jame Mosque is a single-domed square shaped mosque and built entirely of brick.Through the analysis of An Arabic inscription, originally fixed over the central archway of eastern wall, can now be found fixed to an enclosure wall of a nearby newly built mosque, locally known as Pashchimpada masjid (mosque). 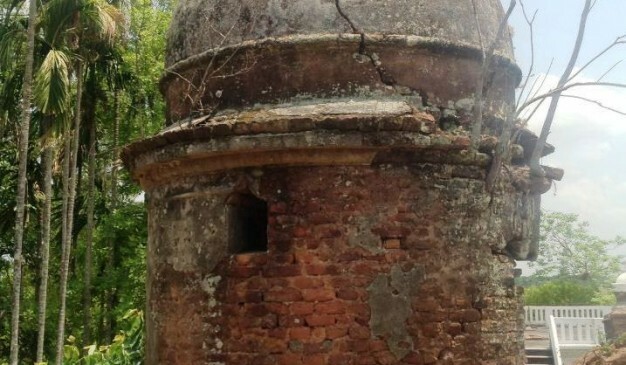 According to the inscription, the Rikabi Bazar Mosque was built by one Malik Abdullah Miah, son of Amin Khan Fakir Miah, in 1569 AD during the reign of Sultan sulaiman karrani. 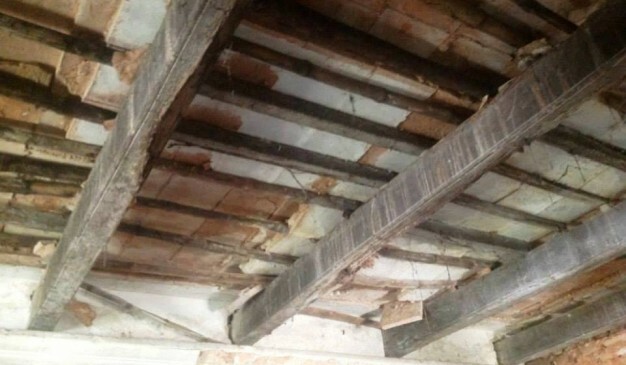 The walls of this mosque are about 2.13m thick.There were four corner-towers in the four exterior angles of the building, but these were removed at the time of renovation work. The mosque has five arched-doorways, three in the east and one each on the north and south sides. The north and south doors are now used as windows. All the arches are of the two-centered pointed variety. The central archway in the east is bigger than the flanking ones. Corresponding to the three eastern archways there are three renovated semi-circular mihrabs inside the qibla wall that are set within rectangular frames. Like the central doorway, the central mihrab is bigger than its flanking counterparts. The north and south walls have two alcoves on either side of the archway. 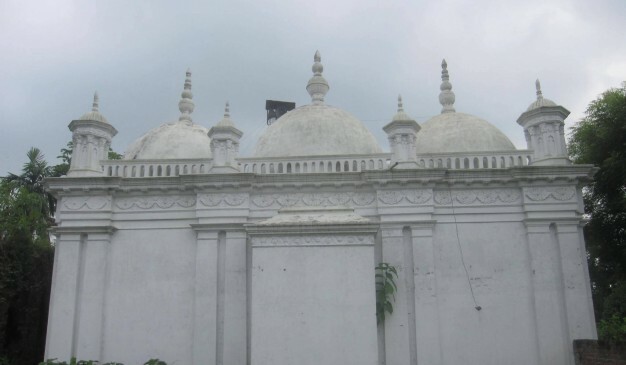 The square prayer hall of the mosque is covered with a large brick shouldered dome, which rests on the four blocked arches over the central mihrab and the three axial doorways springing from the brick pilasters, two inside each wall, in combination with Bengali pendentives and half-domed squinches on the upper angles. An octagonal drum can be seen externally in the lower part of the dome. The parapets and the inner side of the dome is decorated with rows of blind merlons, and each rectangular frame of the three mihrabs is crowned by a frieze of blind merlons. These are not original ornamentations. The outer walls of the mosque were once ornamented with terracotta plaques, but now these are all missing. 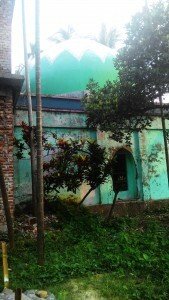 The mosque is at present covered with cement plaster. Hazrat Sharfuddin Abu Tawama’s Tomb and Mazar is situated just eastward to the Mosque in mazar Complex, connected to the Mazar of Hazrat Ibrahim Danish Mand. 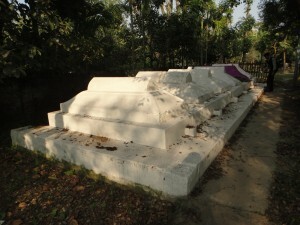 Without any inscriptional evidences, local people believe that this Grave is belong to the Hazrat Sharfuddin Abu Tawama. There are six graves in a row and second one from the east is belong to Hazrat Sharfuddin. This Mazar is surrounded by a fence wall. In that brick wall there is a stone inscription had been found. On the inscription a short description is written about the time period of a Mosque situated just west to the Mazar area. Hazrat Sheik Sharfuddin Abu Tawama hails from Bhukhara. 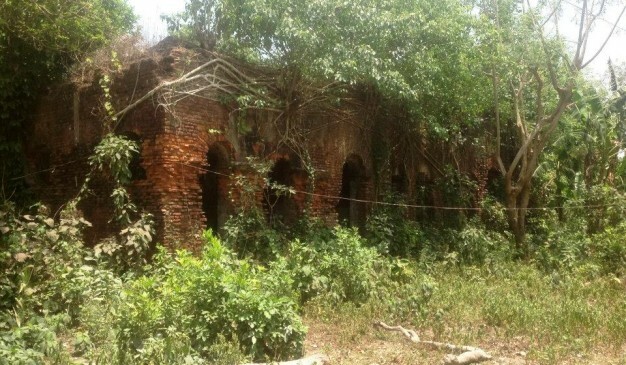 During the year 1274-1277, he came to then Sonargaon along with his family via Delhi and Manere of Bhiar. 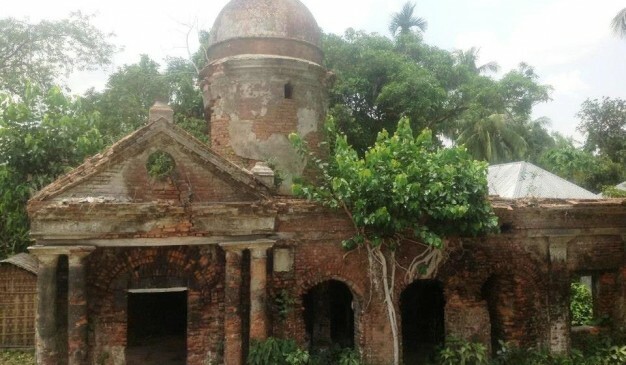 From Maner, a 17 years old pious boy Sheik Sharf-Uddin Yahia Manery took bayet in his hand and accompanied him to Sonargaon. Hazrat Sharf-Uddin Abu Tawama got the blessing of Hazrat Ibrahim Daneshmand (RA) who induldged him in establishing a Khankha to preach Islam in the area. He established Khanka to make the same one of the high standard educational institution with the help of his diciple Hazrat Sheik Sharf-Uddin Yahia Manery, who became the celebrated mentor and teacher of the Khanka. 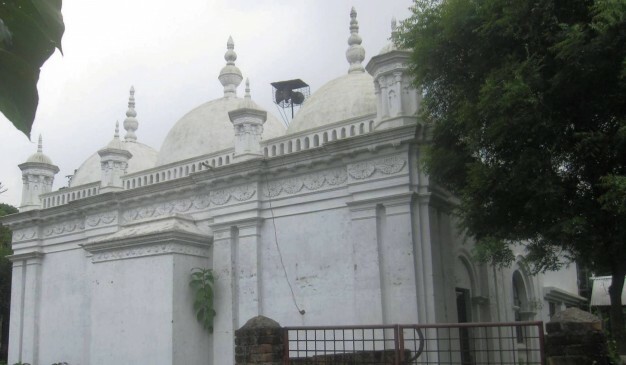 Hazrat Sheik Sharfuddin Abu Tawama died in the year 1300 AD and buried within the premises of Darga Bari which is at the eastern side of Mograpara. Unfotunitly the grave of Hazrat Sheik Sharfuddin Abu Tawama (RA) does not have any shed nor the place could be said very well maintained area.